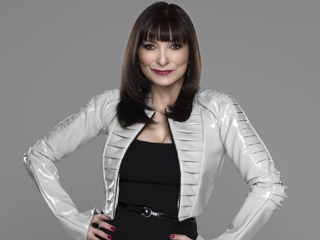 A few years ago I was invited me to hear Jeanne Beker interviewed live at a local Jewish Book Fair. It took a lot of persuading to get me there as I assumed she would just be talking about her just released Tween book on entering the fashion world. Wrong! I sat there entranced as she openly shared her life story as well as that of her parents. All night I kicked myself for not bringing my recorder as it was just the kind of interview I loved the most. Because I don't have proper notes from the evening, it is too risky to share what I remember of her family's journey. Memory is never totally accurate. I do, however, want to share some highlights that were significant to me. The first noticeable thing about Beker is her daring. She doesn't seem to have the same amout of self-doubt that many of us experience - something that keeps us from grabbing that ring and running with it. From landing a role at her first audition with no prior acting experience, to sharing openly with the largely Jewish audience how she approaches her faith in practice, she makes no apologies for who she is. She doesn't attempt to convince others to feel the same way or try to justify her choices, she just lays them out as facts. This is a lesson I am still trying to absorb and a hard one for me to incorporate into my life on a daily basis. Another nugget of wisdom I have shared many times was something she said to a fan. When this person ran up to her in excitement and blurted out, "I want your job," her response was, "Get your own." Harsh one would think. Then she went on to explain what she meant and it all came together for me as an editor. Fashion TV has been running for over 20 years. What she wanted was for this person to dig deep and bring something new to the table - don't take my job and repeat what was done before, create something new and better. I have passed this on to many people who ask about starting a magazine and also keep this in the back of my mind as my partner and I make choices regarding our fashion magazine. Despite industry pressures to go with something already proven, each of us will make our mark in the long run by offering something new and creative. Last to come up was how she felt about the current fashion industry. Beker expressed surprise that with technology advancing so quickly, it hasn't had more of effect on the fashion world. One of the few examples of someone experimenting with innovation is Hussein Chalaya. While his transforming garments were groundbreaking, in general the fashion world is seriously lagging behind. Fabrics, drafting models and construction techniques should be moving forward at a pace in keeping with what is happening in the rest of the world. There was so much more she shared, but these are the highlights that rise to the top when I think back to that interview. She is on my mind today as she is in town launching her clothing line. I hopefully will get the chance to hear her speak again, although I doubt it will have the depth of the amazing interview I was fortunate to hear last time. For those who want to know more personal information, you can visit the Fashion TV bio. It only lacks her family's history which is pretty amazing in itself. For more check out Beker The Sequel.